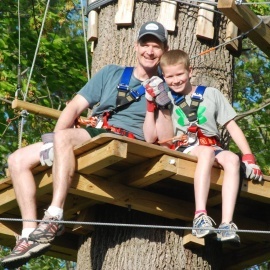 A combination experience of zip lines with tree-to-tree challenge bridges. Multiple color-coded trails mean fun and challenges for beginners or experienced, ages 3 and older. Kids, teens, adults, families, groups. "See you in the trees!"